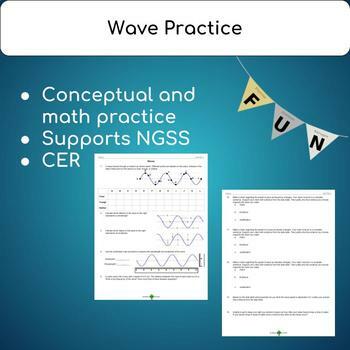 4 practice pages to support *Next Generation Science Standard HS-PS4-1: Use mathematical representations to support a claim regarding relationships among the frequency, wavelength, and speed of waves traveling in various media. Contains guiding questions on parts of a wave and effect of wavelength, frequency, and type fo medium on wave speed. Students then use data to complete claim, evidence, and reasoning on the effects of wavelength, frequency, and different mediums on wave speed.